At The Spott, we use qPCR technology to ensure your medicine is safe. PCR is a laboratory method our cannabis testing facility uses where a thermostable enzyme doubles (amplifies) the quantity of a short specific part of the target DNA (amplicon) in successive heating/cooling cycles. In every cycle the number of short specific sections of DNA is doubled, leading to an exponential amplification of targets. With qPCR, two additional steps are incorporated into the process: First, the amplified DNA is fluorescently labeled and second, the amount of the fluorescence released during amplification can be measured in direct proportion to the amount of amplified DNA. The fluorescence in the reaction is monitored during the entire qPCR process. The higher the initial number of DNA molecules in the sample, the faster the fluorescence will increase during the successive qPCR cycles. In other words, if a cannabis testing sample contains more DNA targets, the fluorescence will be detected in earlier cycles. The number of cycles required to produce a given amount of flourescence is termed quantitation cycle (Ct for short) and is the basic data output unit of qPCR. The lower Ct values mean higher initial copy numbers of the target DNA. This is the basic principle of quantitative approach that real-time PCR offers. Primers and probe bind to target DNA. 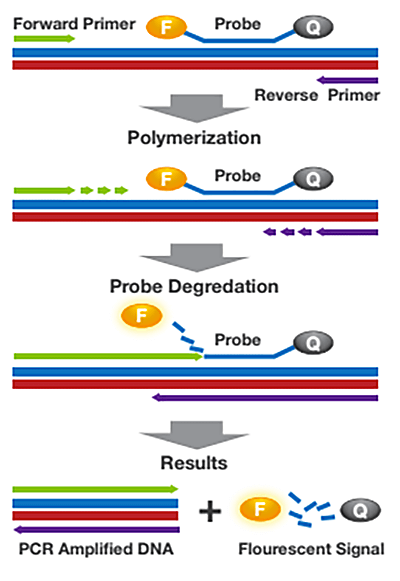 PCR occurs, primers are extended on forward and reverse DNA strands. Probe is degraded as a result of polymerization and fluorescent signal is generated. Target DNA is amplified and fluorescent signal can be measured and quantified. What Does a qPCR Data Output Graph Tell Me? The figure to the left shows examples of both positive and negative microbial testing results. As the target DNA in each sample is being doubled (amplified) through successive qPCR cycles the fluorescence increases and is measured on the y-axis. Samples containing the highest initial number of target DNA molecules result in the fastest increase of fluorescence and appear further left of other samples containing less initial DNA. The positive result shows a red line indicating the presence of microbial DNA which is tagged with a red molecular dye. The blue line on the positive result indicates the cannabis DNA that is present and is tagged with a blue molecular dye. The negative result shows only a blue line indicating only the presence of cannabis DNA with no microbial DNA present. All PathogINDICAtor™ test runs include a screen for cannabis DNA. This feature serves as an on-board control that indicates the correct performance of all test parameters. In all areas of molecular biology, the method of choice for DNA quantification is real-time PCR or quantitative PCR (qPCR). qPCR enables us to determine the exact concentration, both relative or absolute, of the original DNA in the cannabis sample. The key advantage of qPCR over other techniques is that qPCR allows us to determine the initial number of copies of template DNA with specificity and high sensitivity over a wide dynamic range. Furthermore, because real-time qPCR reactions are run and the data is evaluated in a unified, closed-tube qPCR system, opportunities for contamination are eliminated. Plate culture techniques produce results that are subject to human interpretation and thus highly variable. They provide very little information about the actual species of mold or bacteria present, and take 5-7 days to produce results. Quantitative PCR can revolutionize Mold and Bacteria testing for Cannabis!!! The Spott is leading the field in Cannabis qPCR and Next Generation sequencing of Cannabis genomes and microbiomes. Dangers of Microbial Contamination in Medical CannabisThe only registered fatalities from cannabis use has been due to microbial contamination growing on the cannabis(1-9). As a result mold and bacteria testing has become an important aspect of safety testing in the cannabis markets. Heat and radiation are often used to reduce mold and bacteria CFU counts on cannabis. While this treatment reduces the viability of microbial growth, it does not destroy potential microbial toxins like Mycotoxin orAflatoxins. As a result, these decontamination methods can enable cannabis that passes CFU based methods but is still laced with microbial DNA and microbial toxins. Cannabidiol is known to be a potent inhibitor of the liver enzyme CYP3A4 (10-11) required to metabolize and clear Aflatoxin from the human body making it dangerous combination to fail to detect. 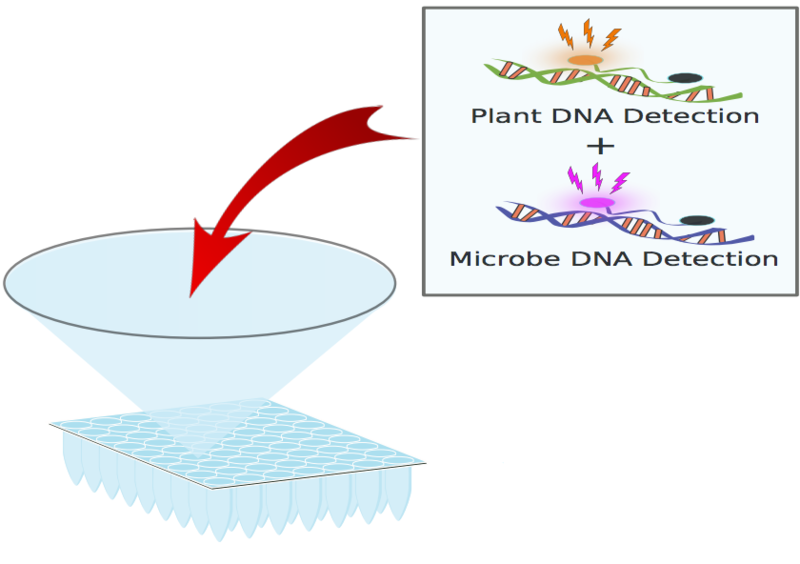 Multiplexed qPCR assays enable the detection of live and dead microbial DNA, thereby enabling a better understanding of prior fungal growth and potential toxins. Culture based methods are blind to this and require days to deliver an answer. Verweij, P.E., Kerremans, J.J., Voss, A. & Meis, J.F. Fungal contamination of tobacco and marijuana. JAMA : the journal of the American Medical Association 284, 2875 (2000). Kagen, S.L. Aspergillus: an inhalable contaminant of marihuana. The New England journal of medicine 304, 483-484 (1981). Szyper-Kravitz, M., Lang, R., Manor, Y. & Lahav, M. Early invasive pulmonary aspergillosis in a leukemia patient linked to aspergillus contaminated marijuana smoking. Leukemia & lymphoma 42, 1433-1437 (2001). Hamadeh, R., Ardehali, A., Locksley, R.M. & York, M.K. Fatal aspergillosis associated with smoking contaminated marijuana, in a marrow transplant recipient.Chest 94, 432-433 (1988). Cescon, D.W. et al. Invasive pulmonary aspergillosis associated with marijuana use in a man with colorectal cancer. Journal of clinical oncology : official journal of the American Society of Clinical Oncology 26, 2214-2215 (2008). Chusid, M.J., Gelfand, J.A., Nutter, C. & Fauci, A.S. Letter: Pulmonary aspergillosis, inhalation of contaminated marijuana smoke, chronic granulomatous disease. Annals of internal medicine 82, 682-683 (1975). Sutton, S., Lum, B.L. & Torti, F.M. Possible risk of invasive pulmonary aspergillosis with marijuana use during chemotherapy for small cell lung cancer. Drug intelligence & clinical pharmacy 20, 289-291 (1986). Marks, W.H. et al. Successfully treated invasive pulmonary aspergillosis associated with smoking marijuana in a renal transplant recipient. Transplantation 61, 1771-1774 (1996). Langouet, S. et al. Inhibition of CYP1A2 and CYP3A4 by oltipraz results in reduction of aflatoxin B1 metabolism in human hepatocytes in primary culture.Cancer research 55, 5574-5579 (1995). Langouet, S. et al. Metabolism of aflatoxin B1 by human hepatocytes in primary culture. Advances in experimental medicine and biology 387, 439-442 (1996).